Pit bull puppies are adorable, especially when they're small, and tend to put everything in their mouths as they explore the world around them. These pups — usually Staffordshire bull terriers, American Staffordshire terriers, and American pit bull terriers or mixes of these dogs — are highly energetic pooches who love to play. Unfortunately, if they start biting, even playfully, as puppies, those bites can become more serious when they are fully grown dogs. That's why it's so important to curb biting behavior when your pit bull puppy is young. Adult pit bull teeth can cause a lot of damage even if your pooch is only playfully biting you, so it's best to stop this behavior in puppyhood. To curb this behavior, you'll have to teach your pup manners using positive training methods. This and a good supply of toys should keep your pit bull pup from biting you, others, or your possessions. Bite inhibition is a term that refers to the ability of a puppy to regulate how often and how hard he bites. One of the main ways a puppy learns bite inhibition is by playing with their siblings. During rough play, if a puppy bites his sibling, the other puppy will cry out and stop playing. This teaches your pit bull puppy that biting hard ends the fun. When bitten by his siblings, your pup learns that biting hurts. After all, even little pit bull teeth can be quite sharp. This realization teaches the puppy not to bite as often and not to bite as hard even during playtime. According to Purdue University Extension, keeping a puppy with his mom until at least 8 weeks of age is the best idea to help him learn social behaviors like bite inhibition. Puppies will mouth things around them as a way to learn about their environment, just as human babies do. Plus, young pups go through a teething phase where their gums hurt. Little pups are born toothless before their baby teeth come in between 2 and 8 weeks of age, according to PetMD. Their adult teeth come in between 4 and 7 months of age, so, during this time, they'll need to chew on something to ease the pain of teething. Provide your pit bull with suitable toys to chew on, including puzzle toys that you can fill with yummy treats like peanut butter. With toys to chew on, your puppy will be less likely to try to bite you, your shoes, or your couch. You'll also want to carry these toys around, so you have them ready for playtime when your pup gets restless. Pit bulls are energetic dogs who may bite you while playing. If this happens, it's important to stop playing immediately after saying a phrase like "Ouch" in a loud, firm voice. Stop moving so you won't become a more interesting target. As playtime with their siblings teaches them, this type of reaction shows puppies that biting ends playtime and that you are not pleased with this type of behavior. Let your puppy sit for a few seconds before engaging him in play again. Each time there is a bite, repeat this process until your puppy stops biting. Briefly stopping play with your pup is the best way to prevent unwanted behaviors like biting because your pup wants to interact with you and pit bulls are very dedicated to their pet parents. For pit bull puppies gnawing on items like shoes or bedding, use a bitter spray deterrent. This type of spray is found in pet supply stores and tastes unpleasant to your puppy but won't hurt him. If you notice that your puppy continually tries to bite you during playtime, brief periods of ignoring him after saying "Ouch" may not be working. That's where timeouts come into play. After your pup bites you more than three times in 15 minutes, it's time for a timeout, recommends the ASPCA. When your puppy mouths your hand or feet hard during playtime, say "Ouch," stop play, and ignore your pup for 20 to 60 seconds, with longer breaks for each successive bite. These timeout periods reinforce the notion that fun things stop when your puppy bites you. In addition to ignoring your pooch when she tries to bite you, you can also redirect the behavior to something acceptable like chewing a toy. This way, your excited puppy has an acceptable outlet for her desire to bite when she's very excited. Because this is an acceptable object to bite, remember to praise your pup when she does bite her toys. If your puppy tries to mouth your hands, give her a toy instead. As she plays with and bites the toy, praise her for this behavior. Pretty soon she'll understand that toys are acceptable to bite but human appendages aren't. It's tempting to engage your pit bull puppy in games using your hands as toys. After all, your little pup is so adorable and small, but she won't be small forever so resist the temptation. Only use dog toys to engage your pooch during playtime, so your dog understands that hands are not an acceptable chew toy. Avoid sending mixed messages by telling her not to bite but then allowing her to bite your fingers. The same goes for your feet and ankles if your pup loves to chase you. Only allow her to chase toys that you throw, not your feet. If she does chase and nip at your feet, it's time for a timeout. You can also redirect her behavior to an acceptable toy. Pit bull breeds were originally bred to fight other dogs, and while your pit bull pup may not bite you, he could injure another animal. This is unacceptable and a good reason why socialization around other dogs and cats is a good idea from a young age. With proper supervision at all times, you can monitor your puppy around other dogs and discourage him from attempting to bite another dog or cat. Just as with you, you'll want to keep all interactions with other dogs or cats positive. Don't keep favorite toys around or food which your puppy could become jealous over with another animal. Allow the dogs to play and if any biting occurs, immediately take your pit bull puppy away to stop the behavior. Remember, you want to teach your pup that biting stops the fun. It's important to remember that there are a lot of myths out there regarding pit bull teeth and pit bull lockjaw. Pit bulls do have a strong bite, but they don't have locking jaws, according to the American Pit Bull Foundation. That's not to say that you shouldn't teach your puppy not to bite, but be aware that pit bulls don't pose any more of a threat than other medium- to large-sized breeds. Most pit bulls have a better-than-average rating on the American Temperament Test Society personality tests than other breeds of dog. This goes against the myth that pit bull temperament is naturally aggressive. In fact, it's the opposite, especially when it comes to people. With proper training, your pit bull puppy should be a perfectly well-behaved canine citizen. Pit bull puppies are most likely to bite you or other dogs when they have a lot of pent-up energy. 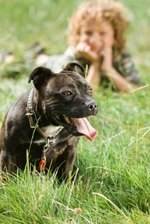 Because pit bull breeds are high-energy, it's a good idea to keep them active. Taking your puppy on walks around the neighborhood and participating in lots of fun games like fetch in your yard or at the dog park is a great way to keep your active pup busy. With all of that activity, he'll be much less likely to bite. Most importantly, during your time with your pup, you want to encourage him to be calm when he's not playing. What this means is that when you are heading out for a walk, wait for your puppy to calm down before opening the door. At feeding time, wait for him to sit calmly before giving him his food, recommends Cesar's Way. This lets your pup know that excitable behavior, which is when he's most likely to bite, outside of playtime isn't acceptable. Pit bulls and dogs in general normally won't bite without giving you some warning beforehand. Growling, staring, and snapping are all signs that your dog is agitated and going to bite. If you discourage these behaviors, you'll end up with a pooch who bites without warning. Instead, pay attention to your dog's body language and use it as a way to avoid a bite. Pit bulls, like all dogs, will still bite if they feel threatened by you or someone else. When you notice any signs that your pit bull puppy is annoyed and is warning you of a bite, walk away to diffuse the situation or stop others from bothering your pup. Not only does this let your dog know that her bite warnings are OK, but it does establish that you won't force her into unsafe situations. It should reduce any biting behaviors because it strengthens your bond. It's important to remember that physical or verbal punishments of your pit bull when he bites will only serve to worsen this behavior. Eventually, your dog will come to fear you and will be more apt to bite out of that fear. Ignoring your pup when he bites and redirecting his behavior are the only ways to deal with a biting pit bull. Positive reinforcement of the behaviors you want — like playing with toys — through to treats and praise works well with pit bull puppies. Pit bulls do have a hard bite as adults and can inflict a lot of damage if they have been taught to fear humans through physical or verbal punishments. These types of punishments can lead to lifelong problems with aggression, which is something that you don't want. If you have rescued your puppy from an abusive situation, it's important to consult with an animal behaviorist to prevent his behavior from becoming more dangerous as he gets older. The behaviorist can work with you to prevent fear-based reactions like biting. One of the main ways you can prevent your pit bull puppy from biting due to aggression is to have her spayed or neutered. Pit bull temperament can be negatively affected by the desire to mate, which could lead to aggressive behavior when your pup reaches sexual maturity. Neutering your dog prevents your dog from seeking a mate or going into heat, which curbs any potentially aggressive actions like biting, according to PittieLove Rescue. Spay or neuter your pup before she's 6 months old, the usual age of sexual maturity, recommends Cesar's Way. This will also help with training because she's always focused on you, not another dog, which allows you to teach her basic manners. It even helps to curb inter-pet aggression toward other animals, preventing your pit bull pup from biting other dogs or cats.